A few nights ago I saw Jack White in concert. It was a wonderful night, and a big part of that was due to a new rule he has imposed on all his tour dates: no phones. When you arrive, you have to put your phone into a neoprene pouch, supplied by a company called Yondr, which they lock and give back to you. If you want to use your phone during the show, you can go into the concourse and unlock it by touching it to one of several unlocking bases. The concert area itself remains screen-free. This is an interesting article but, for me at least, a weird one. I don’t have a smartphone. My phone is about 15 years old and the reason I keep it is because I have 4 days battery life and really…what do I need a phone for? The odd text message. The odd phone call. That’s it. Need directions to a place? I look them up beforehand, or ask someone nearby or just like… do what I’ve done on occasion and just… look around and pick the direction that seems right. That last one I did in Paris because I don’t speak French but at the same time I just didn’t want to talk to anyone anyway. Did I get where I wanted to go? Actually yes. Did it take a long time? No, because somehow I picked the right direction. The article says “everyone came just so they could be there” – which I think would have been true even if everyone could have kept their smartphones. I’ve been to the odd gig where the artist performing has been pretty hyped in the press and you can see the subset of the crowd who is there so that they can say that they were there (you can kind of tell who they are, because they tend to be standing in circles talking to each other at the tops of their voices all the way through and it would probably have been cheaper to hang with their friends in a pub or something). I can’t say that I’ve personally felt the black hole of disengagement from the smartphone using crowd around me. Perhaps it’s the fans that the artists I go to see attract? Anyone who shows up for the support acts is always there to actually see the support act that their ticket money is going towards. Sure, people use their phones between acts – but that doesn’t prevent the crowd doing an impromptu sing-a-long to the Queen song that drifts out of the speakers while we wait. But yeah. I don’t have a smartphone. I go to gigs on my own. Sometimes I’ll talk to the people around me (nearly all of whom have smartphones in their pockets). Mostly, I like being there and hearing the people chatting around me but I don’t necessarily have anything to say to them. I’m content to sit or stand and just wait – I don’t need the constant entertainment of a phone or conversation with another person. So maybe the change that the author of the article experiences wasn’t because everyone around them didn’t have a phone, but primarily because they personally didn’t have a phone. All of the things they talk about people doing at the gig without their phones, they have been doing at all the gigs where they had their phones – the author just didn’t notice. Today my Granddad would have been 102 years old, had he not died 14 years ago. He missed his birthday that year by a few days. We went out to the local carvery and had roast dinner in his honour. Inevitably we will always go out to eat roast dinner, because the right variety of bits for a roast dinner is tricky when you’ve only got two people to eat the thing. 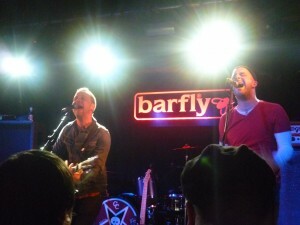 On Wednesday night, I went to see Larry & His Flask at the Islington Academy. Weirdly I don’t think I had really listened to any of their music, since the last time I saw them live, bought an album and played it in the car on the way home. All I knew was that I enjoyed the last time I had seen them and it felt like ages since I had seen them and that I should see them again. Which, of course, was the right decision. Sam Russo, whose music I also like, and Crazy Arm, whose music I’d never heard but I think Emma likes, supported and were good. The last time I saw Sam Russo, he was supporting Dave Hause and he’d done his leg in but remained charming. He’s still charming and his music is still great but seems to admit to a lot of crime? He says he didn’t murder anyone, which is good. Larry & His Flask though. I was thinking as I stood there listening, that my Dad would have really enjoyed their music. Being an only child, my parents were always fairly protective (maybe overprotective as I’ve always been cautious anyway) so my Dad used to come to gigs with me. He took me to my first gig – AFI’s Nightmare After Christmas gig at the London Astoria back in like 2002. We went to festivals and gigs and I never minded that I always “had” to go with my Dad because we had a great time and he was always up for going. I suppose maybe I was lucky that my Dad would listen to the music I liked – it always seemed more difficult for other people I knew whose folks weren’t keen on them going out late on a school-night and there was the tension between having to hurry home after and not wanting to hurry back. No such problem for me and my Dad, because since he didn’t like public transport, he would always drive us there and back and we didn’t have to contend with the thought of missing the train. Plus like, he would buy the tickets and the drinks and the merch because he was my Dad and I was the child. I’ve still got the hoodie he bought for me at that first gig – he popped out during the encore to buy me something, have a smoke and bring the car round and miss all the crowds going for their cars and that. Now, I don’t think my Dad loved AFI, even though he saw them probably 6 or 7 times over the years, but I think he would really have enjoyed seeing Larry & His Flask. This was the thought I had on Wednesday night, along with the thought that everyone there seemed to be really joyful and happy that Larry & His Flask were back on tour and were playing for us all that night. I really want to seem them again. I am hoping that Anthropocene will be at the London Film Festival this year and at a time I can make. Last year, I got lucky that all the various extra religious holidays that my work gives us off overlapped with LFF but this year it’s all a month early so maybe I’m going to have to take actual time off to see films. We’ll see. Our Attitude Toward Aliens Proves We Still Think We’re Special – I guess I just figured that aliens have a Prime Directive, like there is in Star Trek. “A multipotentialite is someone with many interests and creative pursuits. Multipotentialites have no “one true calling” the way specialists do. Being a multipotentialite is our destiny. We have many paths and we pursue all of them, either sequentially or simultaneously (or both). Multipotentialites thrive on learning, exploring, and mastering new skills. We are excellent at bringing disparate ideas together in creative ways. This makes us incredible innovators and problem solvers. I like to think that this ice cream was made from Old ones. About my favourite food in the whole world. I’ve thought about this, on and off over the years, and while I tend to be fairly loathe to really get into it about anything to do with religion 1, I figure sometimes you have to gather your thoughts and brain-dump them somewhere. That and I’ve never been one for paper journals. Child of the internet and all that. Plus I’ve been reading The Power of Place by Winifred Gallagher which touches briefly on some of the thoughts that I’ve had. To begin: The first proper gig I went to was AFI’s Nightmare After Christmas 2 show at the London Astoria in January 2002 – before that, I’d been to the Reading Festival a couple of times. I would have been 17. It was amazing. AFI were and still are a band that I love with all of my heart – in the way that the bands you love as a teenager stay with you for the rest of your life and for me, it’s not just the music they made then, when I first got into them. I’m lucky enough that the direction their music has taken has coincided with the spread of my own taste in music. 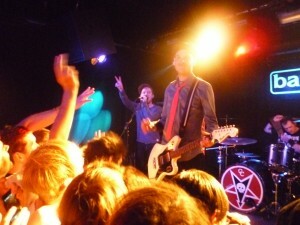 Being there at the front, surrounded by other fans of AFI, was a phenomenal experience. It felt kind of transcendent – like we all had the same joy in our hearts and were all part of the same one thing. Which I suppose we were – we were all in the same crowd, pressed together with all the heat and sweat of the pit, connected by love of the same band. I’ve had the same kind of feeling at other gigs since then – usually when I’ve seen AFI but also at a few Alkaline Trio and Gaslight Anthem gigs. I think there’s something special about the first band to really grab your heart though. Now, as some of you might know, I’m Catholic. I believe in God, transubstantiation, the Virgin Birth, the Resurrection, blah blah blah and all that. I go to church on Sundays and holy days of obligation. I go on pilgrimage to Walsingham every year 3. I don’t feel especially religious 4, but I guess to a lot of people I am due to my somewhat active involvement with my faith. On the other hand, I guess since I’ve got a foot in the door, I get to see all the other people on the inside who are far more involved and active and who I would consider as “religious”. Now, that feeling of almost transcendent oneness is a feeling that I sometimes feel at Mass – mostly when singing certain religious songs, hymns or particularly rousing requiem Masses in Latin. It’s a thing that happens. Now, I’m sure I had a point (other than this whole thing being a bit interesting) back in August when I started writing this post – but I remember that I got interrupted halfway through and it’s been sitting in my drafts ever since. I figured I should at least round it off a little and release it into the wild. To finish, however, is a comment I posted on Frank Turner’s reddit AMA on a thread where someone was asking about reactions to his atheist hymn “Glory Hallelujah”. I really like Glory Hallelujah as a song. I also really like singing along at gigs – it gives me a comparable high/buzz to when I’m really into it singing in Latin about death on Good Friday at church or like…a really good worship hymn that doesn’t make me cringe while I’m singing it. I have discovered that I can’t sing along to Glory Hallelujah. At all. I open my mouth and nothing comes out. I think my brain short-circuits at the paradox. 1 Because, hey, each to their own really, so long as it doesn’t impact negatively on others. 2 Which after a bit of searching is apparently the greatest show that AFI ever did. Or so I am told. 3 This one is a story all on its own, involving the unlikely but apparently somewhat miraculous event of my conception. Probably not one for sharing all the details. 4 There’s probably also a story here where I talk about how atheists/agnostics I know have told me how “normal” I seem for a practising Christian, how with the blue hair etc I look a little unconventional and how my faith, appearance and taste in music are all tied into not caring if I’m like anyone else. I LOVE ALKALINE TRIO. 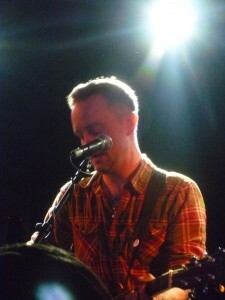 I also love Dave Hause, who supported. I thought what I heard of The Dear & Departed was quite nice. The Dear & Departed were on earlier than I was expecting so I only heard like… the last 3 songs of their set. They were awesome enough that I was crushingly disappointed to discover they’d sold all their CDs already and had to console myself with a Dave Hause T-shirt. I know, I know. Then it was time for Alkaline Trio. Who proceeded to saunter on stage and announce that in the interests of saving the planet or something, they’d not printed a setlist and that it was going to be an all-requests show. I prefer to think that they decided to do it because they’re awesome. If inviting a logistical nightmare – I have no idea how they managed to hear any of the requests (that and Matt can’t remember some of the songs – oops). Clavicle, Cooking Wine, Queen of Pain, This Could Be Love, In Vein, Mercy Me and Blue Carolina were all highlights (but is it a highlight when you’ve included nearly half the setlist?) as was Emma, with added Dave Hause. Radio was, as always, a cracker of a song to end the set on. I think I would have liked to hear Sadie, Crawl and Dine, Dine My Darling or perhaps Love Love Kiss Kiss. Or just more songs where Dan took the lead because he does have a lovely voice, even though Matt’s songs are pretty kickass. In fact, I think I could have listened to them for a couple of hours more. All in all, it was probably the most fun gig I’ve been to recently. CONFESSION TIME. I’d never actually gotten around to listening to any of their music. Not really. I had an mp3 of Jack of All Trades somewhere and I’d heard one of the new songs but that was it. Which is really weird because back when HWM did that split with Alkaline Trio, I got hold of all the Alk3 tracks and liked them and thought “well, you know, the HWM tracks will probably be good too right?” AND THEN JUST NEVER LISTENED TO THEM. Admittedly, that’s somewhat similar to my reaction to the Avengers film when I saw it last week. You get the point though. And they played the two songs I was vaguely familiar with, so bonus. HildaMay were cool. I confess here that I didn’t look them up online anywhere so was genuinely expecting a girl band because of the name. I still liked them though. Sharks were the same as they usually are. I’ve realised that I keep seeing Sharks when they’re supporting someone else. I don’t think I’d put the effort in to see them headline, but they’re ok.
Confession time. I only really know the one Chapel Club song – All The Eastern Girls. This will be important later on. So – Elephant. Two guys and a girl. One of the guys had a fascinating jumper & Mr T-style gold chain combo going on, which was a tad distracting. The other guy… he kept disappearing. No idea why. The girl had an elephant pendant on a really long chain. Other than that, and that one of the songs had purring in it… I can’t remember their music at all. Sorry guys. Other Lives on the other hand were amazing. Everyone in the band appeared to be a multi-instrumentalist. Their music is pretty epic (possibly in part to the breadth of variety of instruments available – kind of sweeping and layered and generally rockin’. I’d definitely see them again. The main event of course was Chapel Club. I’ve already admitted that I only really know the one song (though I do own it on vinyl and took the trouble to record a mp3 of it for ease of listening), so it’s no surprise that I was a bit wary of the musical plan for the evening – there was a first set of entirely new music and a second set of old music. The new stuff was less guitary than the Chapel Club I’m used to, but ok. The old stuff (if music probably at most 2 years old can be called old) was pretty much what I was expecting. Chapel Club have a sort of warm languid sound – something like being tucked up in a warm bed on a cold day. I left after All The Eastern Girls, even though I think there was probably another song left at least…mostly because I was tired and wanted to buy Other Lives’ album. All in all, it was pretty ok.
OMG. The Revival Tour was amazeface. I love Alkaline Trio and the Gaslight Anthem, and I saw Chuck Ragan when he was supporting Gaslight Anthem last year so I HAD to go. HAD TO. I think looking back at the gigs I’ve been to so far this year and the ones that are yet to come… the Revival Tour was the best gig of the year. For reals. Over on tumblr I sad that it was like an epic bromance folkpunk musical, and I think Brian Fallon mentioned it on the night too. Throughout the performance I really got a sense that these guys hang out together and are real proper friends (as opposed to just acquaintances or ships passing in the night or something). It was lovely. Rather shamefully when I don’t know who it was played a cover of a song by Tom Gabel, my immediate reaction was “Oh, he’s the husband of Heather who designed a lot of Alkaline Trio’s artwork and stuff” rather than um, the frontman of Against Me!. Oops. I did see Against Me! when I figured that I should get over to the stage that Alkaline Trio were playing at last years Slamdunk festival and definitely enjoyed what I managed to catch of their set and it seems that they’re supporting Frank Turner later in the year. So I’ll try to see about sitting down one day and actually listening. I know my friend Shaun <3ed them before. But back to the Revival Tour. The guys did a few songs together, then Dave Hause did his thing (with various folks wandering in and out for songs), then Helen Chambers and Sam Russo and this other guy who sadly, I can’t remember the name of did a song each, then Chuck Ragan was his adorable self, and Dan Andriano (who when Brian came on stage to do Crawl with him, ad-libbed a fun little ditty about the guy somewhere over to my right who kept shouting “I LOVE YOU BRIAN”) did a few numbers and then Brian Fallon did some songs annnnd then they all came back on stage for the epic finale. I think the highlight of the evening for me was when Brian was rambling for a bit (as he does, it’s nice) and then went down to the front row and pulled this girl out and got her up on stage to sing. She was a little out of her mind with omgomgomgomg but she was totally ace. The guy behind me said that she’d come with her friend all the way from Germany for the gig. I maintain that Dave Grohl has a serious contender for his nicest man in rock crown. But they’d probably be so nice about it to each other that they’d just both be the nicest men in rock together or something. So. I’m going to ramble about the radio I like to listen to. There’s going to be a lot of rambling. You might want to skip this one. It was pretty handy that I didn’t have any lectures on Monday, because I discovered on Wednesday that the journey on the train takes a fair amount of time and… I would have missed this gig. Which would have been unfortunate. Veto were the support band – I had been expecting two for some reason but I was kind of glad that there was only one in the end. They were pretty good – the singer reminds me a bit of a friend of mine, only my friend didn’t have quite such an epic beard. Morning Parade were aces. Apparently the guy standing behind me has known the singer for TEN YEARS. SINCE THEY WERE THIS TALL. TEN YEARS. YOU KNOW. TEN YEARS. Yeah. I got the picture after the 5th or 6th time he told me. Mostly that he’d been drinking. Then after about ten minutes some other guy behind me grabs my shoulders and says “This is your fifth time?”. So I turned round and was BAFFLED by what appeared to be Frank Turner asking me a question, only… Frank’s had a haircut AND he’s on tour in the US. So clearly, this was not Frank Turner. Just some guy. So I told him “no, this is only my third time seeing Morning Parade.” Random. Incidentally, the first time I saw Morning Parade they were supporting Feeder and Grant Nicholas FORGOT their name. Oops. He was adorable about it though and got the in the end. The second time I saw them… they were also supporting Feeder (do you see a theme here?) and Grant did remember their name. I’ve got a couple of Morning Parade vinyl singles, but nothing more. I should really sort that out. It’s occurred to me that if the Stereophonics made music that was catchy and danceable and that I liked, they might sound a bit like Morning Parade. I <3 The Kill Van Kulls. Really I do. They were an unexpected bonus when I saw The Naked & Famous last year and when I heard that they were releasing a new single and doing a small gig to launch it… well. I was sold. They remind me a little of Tears for Fears crossed with Patrick Wolf, which is actually a pretty nice-sounding hybridisation. Anyway, they were great. Their music really filled out the venue (yeah, I know it was small, but still… you’ll see what I mean later) and, of course, they played the one song that I really know too. I guess I should really try to hit up more of their music, but have a sneaking suspicious that there isn’t really a lot of it about. Also, as soon as they have a tangible EP or album out? It shall me mine. Definitely. And yeah, I know, CDs are getting a little old-fashioned now, but I like having music I can hold. Especially when you’ve had several hard drives die on you. Support came from Ben Burrows and We Human. We Human were OK – as it’s over a week since the event, I don’t really remember much. I know I thought they were OK, but they could have done with being a bit louder somehow or bigger sounding (the music didn’t really fill the place, like I mentioned TKVK’s doing before) and maybe it was down to there not being that many people there… but I don’t know. Maybe there wasn’t enough banter between songs. Maybe the sound needed turning up. They were OK. That’s all I’ve got. They’ll probably be more to my exact taste in time. Ben Burrows was pretty good. Just him, his guitar and his laptop with a sizeable chunk of “you know, I think he listens to a lot of Jeff Buckley” with a smidgen of “a bit ramshackle” for flavour. In contrast to We Human, he really filled the tiny stage and not just because he’s like… a giant (seriously, he was really tall). There was chitchat, there was poking the laptop to make it work without making it fall off its stand and there was guitary bits with some drum bits. I liked it. There was one song that had a one word title beginning with L, I think, that I really liked and now can’t remember the name of. So. In conclusion, We Human were OK, Ben Burrows was pretty good and The Kill Van Kulls were aces because I don’t go and see bands I don’t think will be aces. Unless someone else has kindly given me a free ticket. And now that I’ve had some time not trying to remember that Ben Burrows song? I think it was called “Lariat”.